If you're having people over to watch the big game you certainly need a lot of grub. Sure, you can lean on the traditional crowd-friendly eats like chicken wings, barbecue, burgers, dogs, etc., but why not color a little outside the lines? That's exactly what I've done here. These mini open-face versions of classic sandwiches will set your spread apart and get you some serious MVP points with your crowd. 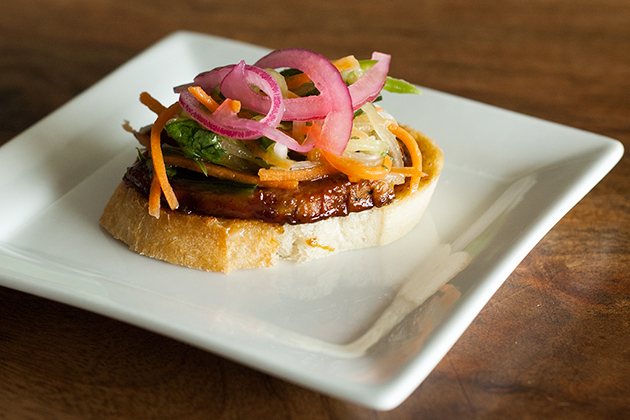 First up is a mini Vietnamese Bahn Mi (pictured above). To keep things simple I used a simple grilled hoisin-glazed pork tenderloin that is sliced thin, but you could use any roasted pork. For the veggies I made a simple salad of the classic ingredients: julienne cucumber, daikon radish, carrot, jalapeno, and chopped cilantro. To keep the prep simple and consistent I used a julienne grater to slice the first three ingredients. The salad is dressed with a pinch of kosher salt, a few drops of sesame oil and a splash each of mirin (Japanese sweet cooking wine) and rice wine vinegar. Dress the salad and refrigerate at least an hour to allow the vegetables to soften and for the flavors to marry. I topped mine with a little pickled red onion. To make the sandwiches, lightly toast buttered baguette slices under your broiler, then brush the top of each with hoisin sauce, add a thin slice of pork, some of the salad, and finish with the pickled onion. Next up is a mini Cubano made with sliced mojo-marinated grilled pork tenderloin, Swiss cheese, ham, dill pickle, and mustard. Start with lightly toasted buttered baguette slices then brush plain yellow mustard on the top of each and add a slice of cheese. Put the bread under the broiler for a minute or two to melt the cheese. 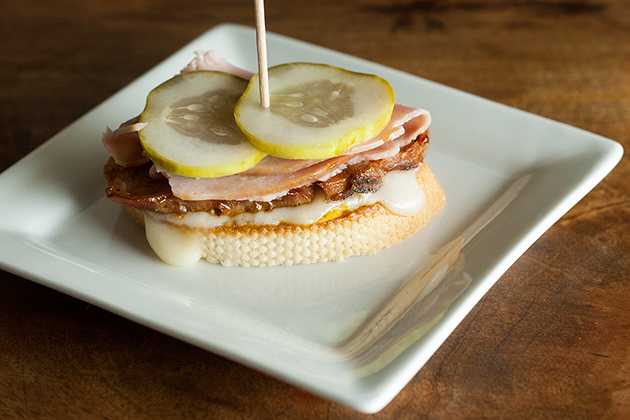 Top each bread slice with a slice of pork, sliced ham, and pickle. Lastly, we round out this sandwich spread with a mini version of what is arguably the best sandwich on topside of this earth: a Reuben! 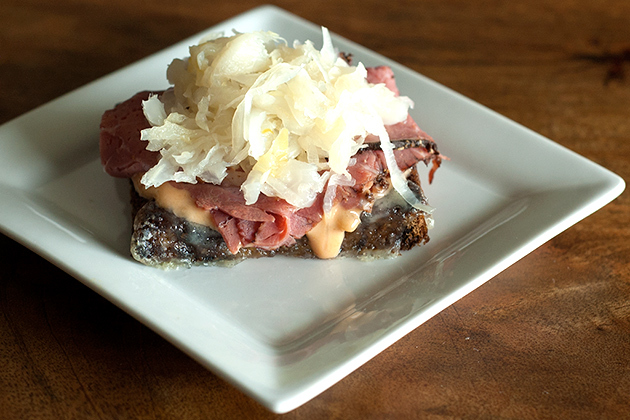 I prefer pastrami to corned beef on my Reuben, but use what you like. Lightly toast the bread slices, top each with a slice of Swiss cheese and put under the broiler for a minute or two to melt the cheese. Smear a dollop of Russian or thousand island dressing on top of the melted cheese. Finish each with folded sliced pastrami and sauerkraut. I hope that this sandwich round-up inspires you to try something new for the big game. Goodness, these all look delicious. Hard to choose a favorite. Pinned for future. Thanks for sharing.